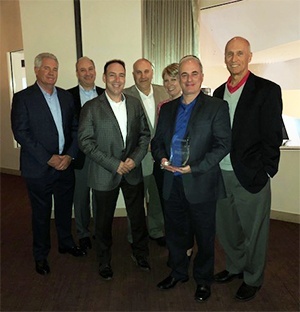 ebm-papst, a worldwide innovation leader in fans and motors, presented their first-ever Distributor of the Year Award to Sager Electronics Monday during the EDS Summit in Las Vegas, NV. 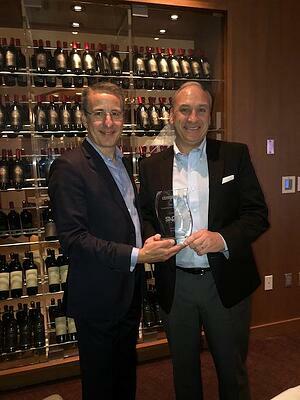 We are proud to present this outstanding achievement award to a company who has exemplified the meaning of a strategic partner. Sager has been a distributor of ebm-papst since 1994, and 2017 was their 4th consecutive year of double digit sales growth with us. This impressive accomplishment was reached through close collaboration and a targeted focus on promoting ebm-papst products and technologies. The engagement between our teams, especially at the field sales level, has been a primary driver of our mutual success. 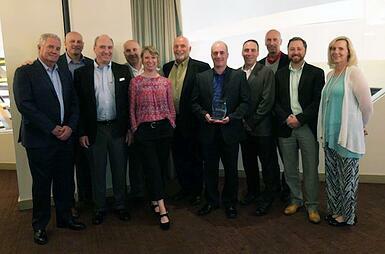 We would like to congratulate Sager for their hard work and dedication to growing the fan sales market! 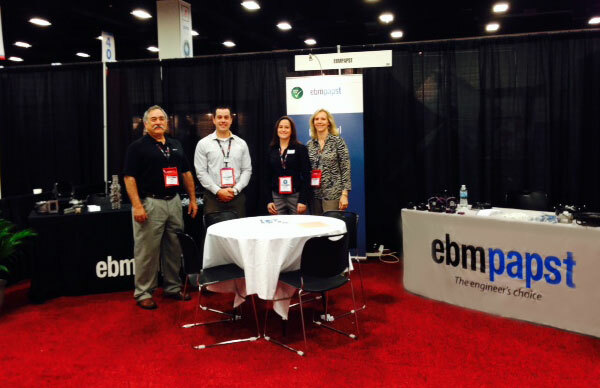 The ebm-papst sales team attended the Allied Electronics' Expo at the Fort Worth Convention Center this October. The event included a diverse gathering of industrial automation, electronic, and electromechanical suppliers. More than 90 well-known suppliers attended that offer the electronics industry power products, fans, connectors, relays, enclosures, switches, wire and cable and much more. Those in attendance accounted for 70% of sales for Allied in North America. As a market leader in fans and blowers, and Allied's top supplier in this category, these biannual events give us an opportunity to demonstrate our products, engage with Allied's sales team and learn from our peers. This year, everyone was talking about the economic upswing, a resurgence of manufacturing in North America along with Allied's sales growth. There was a lot of 'buzz' at the show about how much is happening in the electronics industry today -- everyone is excited about the growth and position Allied is taking in continuing to address this growing market's needs. Allied is focusing on increasing their local sales presence and strengthening relationships with strategic suppliers. The show was a great opportunity for Allied's sales force and managers to learn more about our latest technology, solutions and markets. 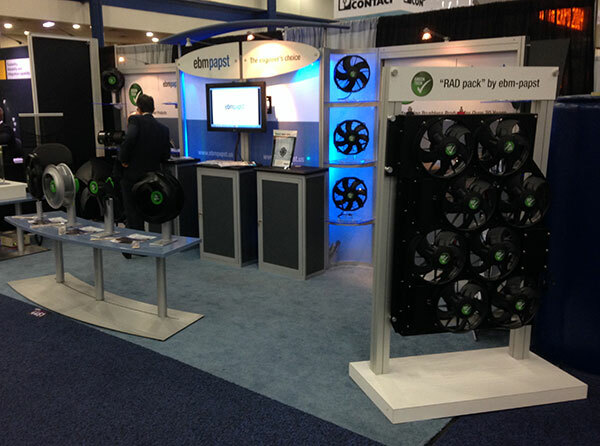 We showcased a variety of air moving solutions including tube axial fans, axial fans, and centrifugal blowers, - a mere representation of our comprehensive product portfolio that includes AC, DC, and EC motor options. Our product display generated discussion about performance, acoustics, and application of the products across a wide range of markets. ebm-papst offers a wide array of product to the electronics industry that provide flexibility, performance and energy savings in various applications. Every January, thousands of HVAC/R manufacturers, engineers, contractors, installation and maintenance pros converge on a major U.S. city for the annual Air Conditioning, Heating and Refrigeration (AHR) Expo. Earlier this fall, we headed south to attend AHR Mexico, the Latin American version of this HVAC/R extravaganza. From September 23-25, more than 10,000 attendees and 250+ exhibitors (the largest number to date) came together in Mexico City. As the 10th largest city in the world – with a metropolitan hub of more than 21 million – the show drew throngs to its Industrial Exposition Center. A wide variety of global and local Mexican companies, representing the HVACR industry, were in attendance this year. New product presentations and over 30 educational seminars were offered by the Mexico City Chapter of ASHRAE. Mexico is an important market for us, and we take every opportunity to engage with our local customers. As in the rest of the world, policies that drive environmentally sound products and practices are gradually making their way to Mexico and all of Latin America; many companies at the show displayed their 'green' products. The air conditioning and refrigeration industries are facing increased efficiency requirements as well as changes to how refrigerants are formulated. Global pressure for sustainability is pushing manufacturers to move to natural refrigerants like CO2, hydrocarbons or ammonia. New Department of Energy environmental regulations are driving U.S. manufacturers of HVACR equipment to comply by 2015. While these U.S. regulations don't yet affect Mexico's domestic HVACR products, they will affect Mexican exports to the U.S. The bottom line? 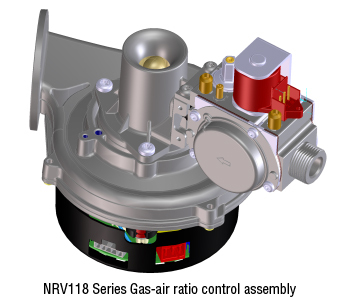 The technologically advanced design and performance modifications that HVACR manufacturers are making to components such as compressors, fans and valves – in both Mexico and the U.S. – will help them remain competitive with environmentally-savvy customers who demand performance, compliance and energy efficiency. We look forward to seeing you next year at AHR Mexico 2015 in Guadalajara! Until then, we hope to see you at the 2015 AHR Expo, January 26-28 at McCormick Place in Chicago – ebm-papst Booth 2110.
ebm-papst Inc. Senior Director of Sales Mark Pierce thinks like a customer because he’s worn that hat. Before joining ebm-papst in 2000, he served as a purchasing/operations manager for an international refrigeration compressor manufacturer. With a B.A. in business administration from Mercer University in Atlanta, Mark enjoys working with ebm-papst customers to solve their thermal challenges and provide solutions for their applications. In his free time, Mark and his wife keep busy with their four children’s many activities. Our nation's public transit (bus and rail) industry is constantly seeking new ways to minimize the environmental impacts of moving people who are escaping gridlock on the roadways. Fuel and operational efficiency and safety are key in a world where taking the bus or train can help save the planet, preserve our budgets and save our sanity. According to a recent APTA news release, this year public transit initiatives prevailed at the ballot box. 71 percent of voters believe in public transportation, and they are willing to invest in the bus, shuttle and rail systems that make their communities desirable places to live. Mass transit will become more and more of a necessity to link city and suburban dwellers in ways that reduce our energy outlay and grow our economy. The industry is leveraging both their market expertise and their predictions on future needs to promote adequate government funding that will build our future public transit infrastructure. Because top original equipment manufacturers (OEMs) attend this event – as well as companies that sell HVAC systems to them – the APTA Expo offered a prime opportunity for us to demonstrate how ebm-papst transportation products are meeting their environmental, operational and safety goals. For bus manufacturers, the shift to alternate propulsion designs (CNG fuel, hybrid, and full electric modes) will continue. Rail systems will continue to upgrade and expand as automobile commutes grow longer and highways become even more congested. 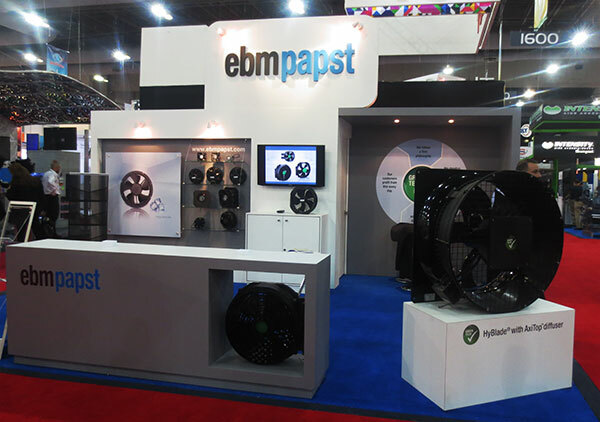 Shows like the APTA Expo give ebm-papst an opportunity to understand how manufacturers and their components suppliers are helping buses and trains operate more efficiently, and how we can help them best meet their needs. The ultimate goal is to keep public transit customers safe and comfortable while supporting reliability, efficiency and safety of the bus and rail systems that move them. Joe Giacona knows that HVACR components within transportation systems must deliver performance and reliability over the long haul. As Market Manager – Transportation at ebm-papst, Joe’s 30+ years of diverse experience in HVACR help him recommend the best ebm-papst products to heat and cool customers’ buses, trains, trucks and other vehicles across North America. Joe actively supports the company’s market development, forecasting, field sales coordination and customer relations. He holds a B.S. in physics from Brockport State College and a B.S. in industrial engineering from the University of Buffalo. In his free time, Joe enjoys cooking for his family, do-it-yourself projects, keeping his 1960 Corvette Roadster in peak form, and making wine from New York and California grapes. 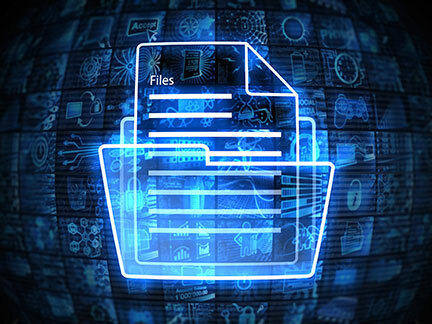 Futurists have repeatedly told us that computers and technology would completely eliminate the need for printed documents. It’s impossible to conceive! How can key processes and procedures that closely chronicle our systems be obsoleted? Like other companies that have worked hard to set up their ISO 9001 quality systems, ebm-papst is driven by “best practices” to ensure clear communication and consistent work standards. Without a document control system, it’s difficult to manage work instructions, customer drawings, design records and system procedures – all the things that ensure quality products and happy customers. In the past, mountains of paperwork suffocated us if we didn’t stay on top of updates and approvals. Hard-copy ISO 9001 documents have been replaced by an efficient, secure, paperless digital document system. How does the new system keep us informed and in compliance? There must be a process to review and approve documents before they “go live” and become accepted procedure. Document changes and revisions must be clearly identified. Processes and procedural documents must be available for reference in the locations where they are used. Documents need to be legible and readily identifiable. External documents must be controlled; these include customer drawings, purchase orders and specifications. Obsolete documents must be deleted and removed from use. All the above requirements are now managed with file author and permissions technology, and through secure digital file sharing. ebm-papst employees can access the latest approved document from their workstations, print and use it as needed. But the master copy, controlled by our quality department, is the electronic one. It’s saved thousands of pounds of paper, as well as thousands of hours of work yielding more productivity. We are focused in carrying out ISO 9001 standards in our products, better serving our customers. What is your company doing to harness the ISO 9001 documentation beast? Share a comment below! Quality is part of the ebm-papst Inc. DNA, and Jack Derewonko oversees the processes that keep it that way. As Quality Systems Manager, Jack applies his 13 years of expertise in managing the company’s ISO 9001 and IS0 14001 systems. He also oversees the company’s quality control department, ensuring that return material authorizations, credits, calibration work and corrective actions are properly handled and documented. Jack received his bachelor’s degree in mechanical engineering and materials science with a minor in English from the University of Connecticut. Outside of work, he enjoys fishing, photography, mountain biking, skiing and golf. Remember the hotel room where you barely slept because the AC constantly cycled on and off? The HVAC systems in our homes, offices, hotels and other buildings should keep us comfortable no matter what the weather is outside. And while we expect these systems to perform on demand, we certainly don’t want to hear them running. What strategies can we help supress the sound and vibration of essential HVAC components? Internal compressors and fans are the main sources of noise. If the fan’s rattling or the compressor’s banging, clanking, hissing or rattling, getting the system inspected and serviced should be your first priority. However, cooled air that moves through systems and ducts can create additional sounds. These noises may require a variety of approaches that building HVAC and maintenance pros can address during design, installation or retrofitting. According to a recent column in HPAC Engineering by Michael Ivanovich of the Air Movement and Control Association International (AMCA), even the most efficient fan will perform poorly if not sized properly. Mike’s 14-point checklist can help HVAC engineers save energy, reduce noise and maximize efficiency. Any air conditioner that is in a room with people is going to be noisy, which is why most are located elsewhere. Ideally, the only noise that should be heard is that of air flowing into the room. Placing the air conditioning equipment in a basement, attic or mechanical closet will reduce noise from the mechanical components. In addition, the bulky equipment is hidden from day-to-day life. be used on the inside of the unit cabinet to muffle noise and to provide thermal insulation. Products such as our AxiTop diffuser and FlowGrid air inlet grill address noise associated with airflow. By reducing the turbulence on the intake of a fan, the FlowGrid minimizes low-tone frequencies commonly associated with large fans. 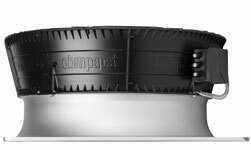 The AxiTop accessory increases the aerodynamic efficiency and reduces sound levels on ebm-papst axial fans. The simplest way to reduce the sound levels produced by HVAC systems is to slow them down. By reducing the rotating speed of the motors (fans and compressors), you reduce the motor noise as well as the noise caused by airflow. Our EC motors are equipped with integrated speed-control capability, providing lower noise and energy consumption when slowed down. What are your HVAC acoustical nightmares, and how are you solving them? Log a comment below! With 12 years’ experience in HVAC systems, Matt Menard, Market Manager – Air Conditioning at ebm-papst Inc., actively supports designers’, manufacturers’ and integrators’ with a wide range of air-moving products. Matt holds a BS in mechanical engineering from Rensselaer Polytechnic Institute. He enjoys skiing, golf and spending time with his wife and two children. To better serve our heating customers with one stop shopping, and to complement our existing line of premix gas blowers, ebm-papst acquired the GB series gas valve line from Karl Dungs GmbH on April 1, 2011. Since then we have updated the design, manufacturing, and system integration of these gas valves to better support current and future growth opportunities. So let’s take a look inside these gas valves to better understand their basic functionality and target application. Dual Safety Shut-off Valve: Allows the flow of gas to the appliance and more importantly shuts off the gas flow when the control system no longer senses flame. Two points of shut-off are required to be a safety shut-off valve that is in compliance with ANSI Z21.78 and CSA 6.20; therefore, if one valve fails to close the second valve will close and stop the flow of gas. Zero Governor Regulator: Controls the outlet pressure of the valve with the goal of zero pressure at the outlet allowing the flow of gas to only occur with a negative pressure signal from the venture mixer. Throttle: An adjustment that defines the maximum gas flow through the gas valve at high fire. 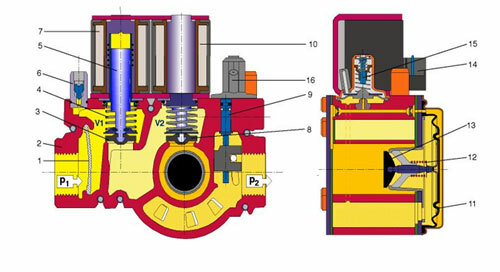 Now let’s take a look at a cross section view of a GB series gas valve to further see how these components are integrated. Gas enters the gas valve at P1, travels through the dual shut off valves (V1 & V2), enters the zero governor regulator (#13), exits the regulator through the throttle, and then exits the valve through the outlet at P2. Perhaps the two most important operational features of the gas valve are its throttle (# 9) and offset (# 15). The position of these adjustment screws are critical to ensure clean combustion at high and low firing rates. 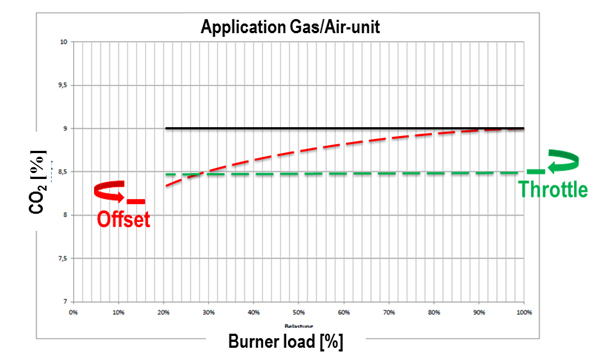 The following graphic illustrates the effects of the throttle and offset on CO2 verses burner load. As shown in Figure 2.0, the throttle adjustment will affect the CO2 at high fire and the offset adjustment will affect the CO2 at low fire. As a general rule of thumb, less excess air (e.g. CO2 = 9%) is required at high fire and more excess air (CO2 = 8.5%) is required at low fire to ensure proper burner cooling when the flame is closer to the burner surface. 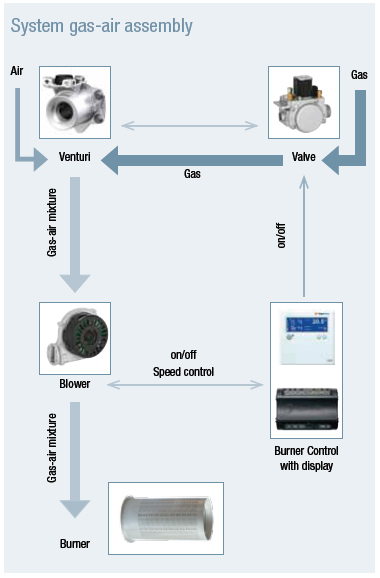 Application: The gas valve is one component in a gas air ratio control (GARC) system that includes the premix gas blower, venturi mixer, and burner control that work together to safely control and monitor the air-gas mixture and combustion process in these appliances (Reference Figure 3.0). Typical applications for these gas valves include high efficiency condensing gas boilers, water heaters, humidifiers, and commercial cooking equipment. Dave Hillburn works with ebm-papst customers to incorporate the right system solutions into their residential and commercial heating applications. With seven years hands-on experience in combustion design, he helps optimize these systems’ output and energy efficiency. A graduate of Central Connecticut State University with a BS in Mechanical Engineering Technology, Dave enjoys playing drums and guitar, sports and travel. 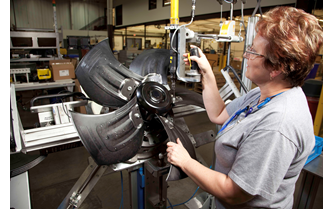 Customers often ask what they believe to be a simple question: what is the most efficient fan? Their logical goal? To identify the most efficient fan type, then select that type for all uses. The simple answer? 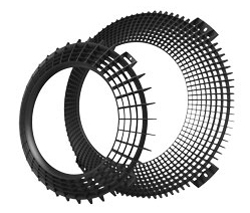 Backward curved impellers have the highest peak static efficiency. But if you’re seeking the best match for your specific heating, cooling or ventilation needs, it’s not that simple. What’s your operating point? The operating point (or duty point) is the target air flow rate in cubic feet per minute and a system resistance (or impedance) in inches of water. The target flow rate is usually a known value. The system resistance or impedance is not always available, but it’s essential in selecting the correct fan. Here’s the experiment I conducted that illustrates the flaw in a “one fan type fits all” approach. I chose two operating points with the same flow rate but with system resistances that differed by a factor of two. I looked at backward curved impellers and axial fan solutions for both operating points. The backward curved impeller provided lower power consumption and noise for the higher system resistance level. But the axial fan consumed less power and generated less noise for the lower system resistance. Keep in mind: the flow rate didn’t change. What’s your flow path? Selecting a fan based solely on the operating point will not necessarily lead to the best results. The path that the air must take through the system must be factored into the selection as well. The impact that the air flow path has on a fan’s selection can be dramatic – it can make a very efficient fan perform very poorly. Changes of direction or sudden contractions in the flow path that could choke off the flow. For example, if the air must follow a right angle, a centrifugal fan with a backward curved impeller or a forward curved blower might be a better solution than an axial fan since the centrifugal fan naturally turns the air 90 degrees. What are your design goals? While the operating point defines the most important variable, power consumption and noise reduction are huge drivers. When noise is a critical factor, the best solution is typically a larger fan running at the lowest possible speed. What are your space constraints? Selection of the right fan must consider the available space within the application. The most efficient or quietest fan may not fit within the available space. Fan selection can’t be viewed as a one-size-fits-all approach. It’s really a compromise between variables. The key to success in finding the right fan is to identify which model results in the fewest compromises. What fan selection challenges have you struggled with? What solutions have you found? Join the conversation — leave a comment below! Scott Beauchemin began his ebm-papst career 15 years ago as an applications engineer. Now Vice President of Engineering, he puts his two decades’ experience in airflow and acoustic testing to work in exceeding customer expectations with fans and blowers that meet their applications’ efficiency and low-noise requirements. Scott earned his M.S. in Mechanical Engineering at Rensselaer Polytechnic Institute and his B.S. in Mechanical Engineering at Worcester Polytechnic Institute. In his free time, he enjoys golf and running. 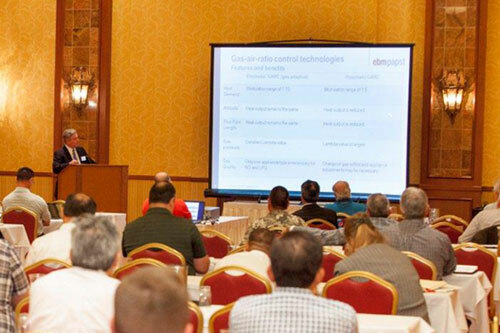 ebm-papst shares latest technology at annual American Society of Gas Engineers! residential and commercial products and gas-air ratio control technologies for high efficiency gas fired appliances. Like the topics, the speakers were a diversified group representing consultants, component suppliers, non-profit organizations and litigation specialists involved in the gas industry. The conference serves as a great opportunity for the speakers to share with industry colleagues the latest technologies and information that may assist in the demands of their job. Whether they’re an application, design, facilities or project engineer there was at least one relevant topic for each of the more than 60 engineers in attendance. Tom presented “gas-air ratio control technologies for high efficiency gas fired appliances” which included both electronic and pneumatic systems developed by ebm-papst and in wide use throughout the gas appliance industry. These systems and their components were originally developed for the European market; rising energy costs have spurred the development of high efficiency gas appliances and these systems are now widely accepted in North America. Today, ebm-papst’s product offering includes induced and forced draft combustion blowers, gas valves, air-fuel mixers and gas ignition controls. A component and system supplier to gas appliance OEMs in many of the industrialized countries around the world, ebm-papst continues to develop new technologies that promote the safe use of gas appliances. To learn more about ebm-papst’s combustion blowers and systems, visit the heating section of our Market Solution Tool or contact sales@us.ebmpapst.com. Established in 1954 in Cleveland, Ohio, the Gas Appliance Engineering Society, and later in 1958 renamed to the American Society of Gas Engineers, members met on a regular basis to discuss gas appliance design and safety, and the proper application of new technologies. Today the members continue to promote and educate the necessary information to support gas appliance development into the next century through white papers, technical conferences, and seminars. The American Society of Gas Engineers is also recognized by gas utilities and gas appliance certification agencies who acknowledge the benefits the organization have brought to the industry. If it cooks or chills food, keeps us warm or improves how something’s manufactured, odds are it requires ventilation. During his 27 years in the industry, Tom Costello has supported the evolution of air movement and combustion systems for residential, commercial and industrial food service, heating and process applications. As market manager – appliance heating and gas at ebm-papst for the past 15 years, he’s helped designers, manufacturers and distributors incorporate the latest fan, blower and motor designs into their products. Tom received his B.S. in mechanical engineering technology from Northeastern University. In his free time, he enjoys golfing, scuba diving and home renovation. What is the Ultimate Global Benchmark for Quality Management? Above and beyond statutory and regulatory standards, ISO 9000 certification is designed to help organizations ensure they meet the needs of customers and other stakeholders related to their products or services. Over a million organizations worldwide are independently certified, making ISO 9001 one of the most widely used quality management tools in the world today. At ebm-papst, the ISO 9001 quality system is used to design and manufacture quality products of the highest degree. Thebenefits of ISO 9001 are far reaching and impact all areas of our company. A consistent approach to meeting customer requirements, improving all aspects of product performance and reducing the defect rate ensure operation savings. To achieve ISO 9001 certification, a company is required to fully document a quality control program and follow the procedures it writes. This does not mean the products are certified to ISO 9001 but the quality system is certified. 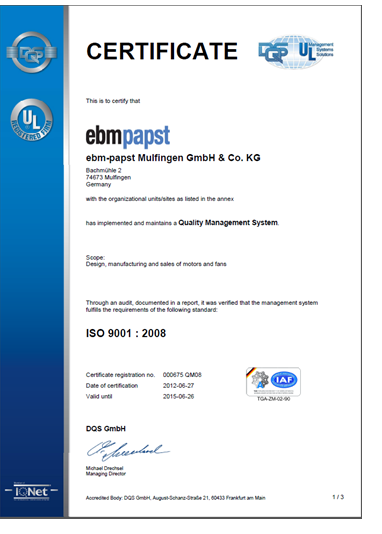 The ISO 9001 quality system at ebm-papst reduces operational costs and improves customer satisfaction. Increased marketability – customers recognize ISO 9001 certification as an important factor when selecting suppliers. Product performance – ebm-papst’s customers expect our products to perform at the highest levels. We achieve this goal with solid designs and well documented quality control programs. Reducing operational expense – quality programs like corrective action, internal audits, and continual improvement reduce defect rates and improve the efficiency of our production lines. Increase customer satisfaction – high quality products help to meet customer expectations which leads to satisfied customers. Improved internal communication – Some of the ISO 9001 requirements focus on self-assessment. This helps ebm-papst employees understand the interaction between departments. We have a focus on internal customers so process controls are established. Improved supplier relations – ebm-papst suppliers play an important role in product quality. We have systems like supplier audits and performance measurements to improve and manage our supplier base. Without proper planning and training, there can be disadvantages of an ISO 9001 quality system. Excessive documentation can lead to control issues and loss of important data. Too few records will leave you without evidence of compliance. At ebm-papst, we are striving for a paperless system which will save time, improve quality, and lower our impact on the environment. Quality is part of the ebm-papst Inc. DNA; Jack Derewonko oversees the processes that keep it that way. As Quality Systems Manager, Jack applies his 13 years of expertise in managing the company’s ISO9001 and IS014001 systems. He also oversees the company’s quality control department, ensuring that return material authorizations, credits, calibration work and corrective actions are properly handled and documented. Jack received his bachelor’s degree in mechanical engineering and materials science with a minor in English from the University of Connecticut. Outside of work, he enjoys fishing, photography, mountain biking, skiing and golf.